Life gets tough, no doubt, but we can learn to navigate the ebbs and flows with grace. Cultivating a gratitude practice is a brilliant place to start. Recently my mind meandered through a string of early, pleasant childhood memories, starting with my older brother weaning me off the training wheels of my bike. Somehow the memories ended with the day my brother got bit by our neighbor’s German Shepard that got loose. After he was bitten on the leg, my brother had the presence to call a friend and ask him to meet me at my elementary school when it let out. His friend walked me home a different way, so I would be unlikely to cross paths with the dog. Together, they ensured that I avoid a very painful disaster—sweet, big brother and family friend. Needless to say, I was feeling a heart full of love and gratitude for my brother after that exercise. Dwelling on those memories changed my whole frame of mind that day. Research has shown that both the practices of gratitude and savoring the positive moments have many health benefits, emotional and otherwise. Studies suggest, for instance, that a greater sense of appreciation contributes to reduced stress and anxiety, better sleep, higher self-esteem, and stronger relationships. Leading gratitude researcher Robert Emmons, Ph.D., notes that gratitude can serve as a useful coping mechanism in difficult times as well. Being grateful doesn’t mean, by any stretch, running away from reality and ignoring the truth of the moment. It could, however, lead to acknowledging the strength and skills that have helped you endure difficult life circumstances, bringing to the foreground what has helped you have that strength, or considering what you learned of value even though the circumstances presented a hard and tough lesson. That’s an important form of gratitude as well. What is most attractive about a gratitude practice is that simple acts that do not take much time or energy or involve any expense can lead to greater well-being. As the author Fred De Witt Van Amburgh once said, “Gratitude is a currency we can mint for ourselves and spend without fear of bankruptcy.” Think about what small steps you might build into your life that enhance your sense of appreciation. They may be acts or gestures you do daily or a few times a week. 1. Maintain a daily gratitude journal. Writing down in a journal, perhaps at the end of the day, three to five things you were most grateful for that day can help integrate into your psyche more of the positive aspects of your life you may take for granted. 2. Incorporate a prayer of gratitude into your prayers of worship and/or a gratitude mantra as part of your meditation practice. 3. Decide that you are going to notice and reflect on at least three things to be grateful for, with a focus on the small things – a flower, a kind word from a neighbor or colleague, a smile from a stranger, the sun shining, the rain helping the flowers in your front yard to grow, the young person who assists you with carrying your grocery bags to the car. If you find this difficult to do on a daily basis, start with a few times a week and build the practice to every day. 4. Integrate repetitive messages of gratitude throughout your day. You might start by creating frequently-used computer passwords that include the first letters of a phrase of gratitude—the letters in IAGFMB@7, for instance, could be used to stand for “I am grateful for my brother”. 5. Make it an intentional practice to express gratitude, either by word or deed, to at least one person every day. Include an expression of gratitude toward yourself on a regular basis as part of that practice, too. 6. Accept and acknowledge others’ expressions of gratitude to you. 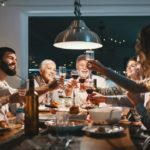 However your sense of gratitude shows up in your day, you may find that an ongoing gratitude practice of simple acts and gestures like those mentioned in this article heightens the pleasure of good moments and softens the tough moments of life. Stephanie Lewis is a certified health, wellness, and mindfulness coach. She is also certified as a Tai Chi Easy Practice Leader through the Institute of Integral Qigong and Tai Chi. She helps people suffering from overwhelm reduce stress and burnout and create their own unique pathway to balance, peace, and well-being. Visit her website LiveWellFlow.com to learn more about her, follow her blog, and access her guided meditations. My partner wants to “slow things down.” Help?